"maggie and millie and molly and may"
e.e.cummings is another favourite poet of mine. He is one of my wordsmiths -poets who are able to use words tightly in a very remarkable way. I group him with Dylan Thomas, Gerard Manly Hopkins and Carl Sandburg. I love this poem for its simplicity and its depth - how many of us can relate to stones as large as alone! In January when we were planning this vacation (planning holidays is my husband's escape - so we start early - very early) I said to Dorothy Siemens - Fiddlesticks Knitting - that I had already found a poem for my weblog and that I had planned to refer to her Creatures of the Reef shawl, if that were OK. 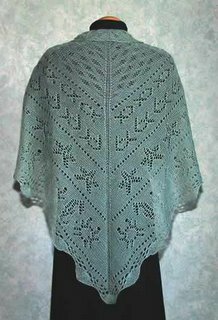 I have seen Creatures of the Reef knit in several colours of Zephyr yarn and each colour changes the shawl into another remarkable place. Shown here in Sage, it is a northern beach, in reds it becomes P.E.I. (Prince Edward Island), in Copper it is somewhere very warm and sunny, I even think that it would work in pink for Bermuda - just pick a colour; knit it; wear it and be transported. The motifs that Dorothy used are so much like those in the poem. There are star fish, crabs, sea horses, shells, fish, waves - all original motifs in the breeziest lace. Just think of the fun of knitting each one and remembering your beach adventures, or dreaming of a time when you will go to the beach too. I won't take the shawl as a knitting project for this holiday. I would rather wait until January, when I need to be taken back to the sea...back to the sun, the warmth, and the freedom. But I've started thinking of the project, particularly the colour. Now let me see, how about Violet for that magical time just after sunset and a little before dark - that half light of our imagination - with the water shimmering under the rising moon...hmmmm...maybe Lilac would be better - it has more blue in it.